Bebecool has been on people power movement watch list for bashing Bobi wine during his torture. People never forget and they got their chance at him At the Tarrus Riley concert on Friday. Barely three seconds when the he took to stage to perform his hit single ‘Love you Everyday’ the unruly fans started pelting him with bottles full of urine. Then a few moments later, polythene bags containing feces started to fly over as they ascended to stage where his song was cut short, removed the mic from him and lights went out. 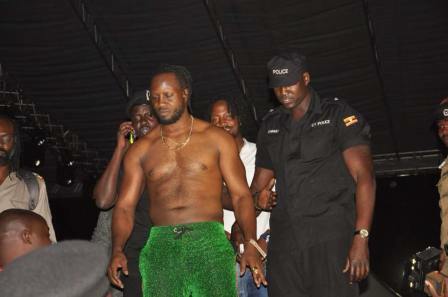 However, the shirtless Bebe Cool remained standing still on stage looking like a lost dog with the crowd still sending in heavy insults towards him as chased him away. This was the second time in a row as the singer experienced one of the worst scenes in the music industry as last weekend he was again denied to perform at club ambiance.